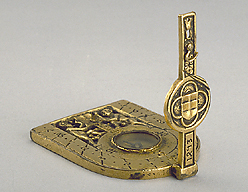 This dial consists of a gilt brass plate in the shape of a shield. The shadow is cast by a string gnomon (now missing), held by a folding arm. The arm is decorated at the centre with a coat-of-arms and is engraved with the date 1453. The other side of the arm has a small catch which keeps the arm itself folded when not in use. The actual dial plate is engraved with hour lines, from [4.30] to 12 to [7.30], numbered by one, divided to the half hour with dots. The centre of the leaf has a compass with magnetic deviation indicated, and the cardinal points abbreviated 'S', 'OR', 'M', 'OC' on the plate outside the compass. On top of the compass are two male figures holding a shield. The reverse of the plate is blank. The instrument is one of a family of dials, similar in general but different for some details: the last two examples are attributed to the Regiomontanus, and the other earlier examples to Georg Peuerbach. Some scholars have raised doubts about the authenticity of these dials, which would be the earliest string gnomon dials and the earliest portable dials incorporating a compass and with polar gnomons. The instrument belonged to the Spitzer Collection and is described in F. A. B. Ward, A Catalogue of European Scientific Instruments in the Department of Medieval and Later Antiquities of the British Museum (London, 1981), p. 21, no.8.